Easter Holiday Club - our club is open when the school is closed over the holidays and all local children are welcome too! We have a dedicated team of qualified and experienced staff providing a high quality learning environment. Is to have a place where children want to come and relax and look forward to playing with their friends in a safe and happy environment. We would like the children to be given opportunities to try out new enrichment activities that they may not normally participate in. We aim to offer a range of activities making sure we appeal to all ages and abilities. For our youngest children we implement the Early Years Foundation Stage curriculum ensuring that a variety of activities and experiences are offered. Spontaneous and child initiated activities are a main focus too and staff are always on hand to offer advice and support to the children implementing activities and playing alongside the children. 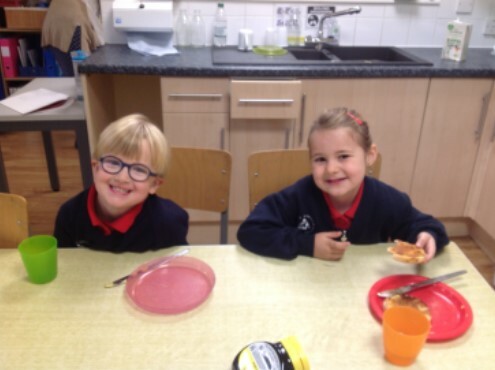 Breakfast - each day children will be offered a choice of muffins, pancakes, crumpets, toast, a variety of cereals, yoghurts and fruit juice. Light Tea - our menu is based on a 3 week rota and changes seasonally and can include dishes such as vegetarian chilli with tacos, crackers with dips and fillings, meat and vegetarian wraps, fish fingers and beans e.g. Included in After School Club there is a selection of fresh fruit and vegetables on offer as snacks for all children. Children attending Holiday Play Club must bring their own healthy packed lunch, a water bottle and enough snacks for during the day. How do I book my child on one of the above services? All services are booked through our School Gateway system. You will need to download the free App in order to make your bookings. This only takes a few minutes and you will only have to do this once. Click here for the App. Please email the above information to: beehive@bishops-down.kent.sch.uk. We will get back to you within 48 hrs confirming your child is in the system and for you to book using the App. After booking your child using the App and for us to confirm your child's place please complete the relevant forms below and return them to either the School Office or download, scan and return via email.